I will watch just about anything with a horror theme that comes out on Netflix. Movies, shows, anything! Okay…not just Netflix, anywhere. I love anything and everything horror. Even the bad ones that everyone hates. I had plans on watching the Haunting of Hill House since I first heard about it. It was always in the plans. But then Mr. Stephen King (my favorite author of all times) decided to comment about how amazing this show was. So of course that made me move a little quicker to watch the show. It took me 3 days to watch all 10 episodes…but I could have easily done it in one day given better circumstances. Work gets in the way of so much stuff! Let’s get down to business. What you are really here for. 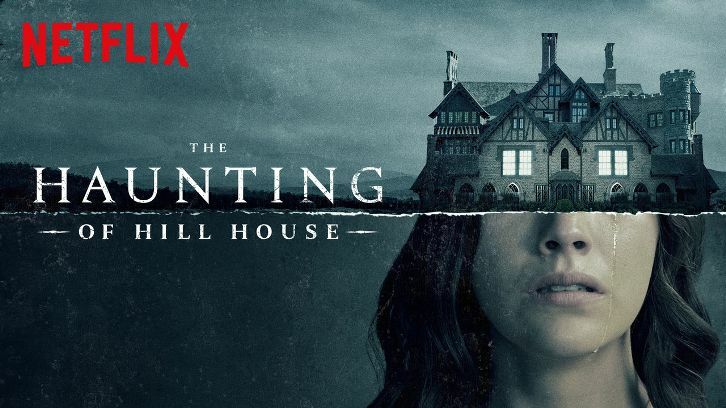 What did I think about The Haunting of Hill House? Okay okay. Let me talk about all the reasons I love this show. I actually have reasons to love this show and not just an over all “I just love it” excuse. First, let me talk about the actors. Every child actor in this movie is phenomenal. It made me wonder if these kids were picked out of some cloning field where they just mass produce great child actors. Not a single one let me down with the believability of their fear. It made the show feel so much more real, like there was some bent neck lady standing behind me, watching me. The adult actors…they were so fantastic. I loved the chemistry between them all, how much they felt like siblings. Not to mention the familiar faces. Carla Gugino who played the lead in Geralds Game, another Netflix Original. She was also on a TV series called Wayward Pines. As well as on Watchman. Then we have Kate Siegel who played the lead in Hush, Netflix original. She is also the wife of Mike Flanagan who had his hands all over The Haunting of Hill House. The camera work of this show was something of magic. Seriously, there had to have been magical creatures moving these cameras because it was so smooth. There was a ton of movement but not once did I worry about motion sickness. To go along with the great camera work I want to add the transitions! There are a ton of transitions from present day to the past and the transitions are so quick, smooth, and seemless. They were also very clear and not once did I wonder where in the story line I was at. The Haunting of Hill House is all over the place. The timeline is not a straight line in either the past or present day. There is a lot of jumping around but it is done is such a way that you know exactly where you are in the story and what happened when. It was so great because you knew what was going on, but there were so many questions you were waiting for answers. It’s one of the greatest things about the show, it answered all the questions, but in it’s own time and it wasn’t stretched out to the point where you just couldn’t continue to watch because you got bored. This show was actually scary! It gave me tingles at the back of my head, which happens when I am legitimately enjoying a horror movie. It doesn’t happen often anymore because things are just not as scary as they once were. Don’t get me wrong, I love horror and the stories, but they don’t scare me as much. This actually freaked me out a little bit. There was even a few jump scares that got me! One of the jump scares I didn’t even see coming and I loved it! The question that arises at this point is, Will there be another season? I have discussed this with someone who thinks there shouldn’t be another season. But I think there should. There are things that could be explored from this point on. We could take a look more into the past of this haunted house. We could look into the future of what could happen or go wrong with this house. I realize that this show is based on a book and with the last episode is the end of the book, it has been wrapped up. (I need to read the book!) That doesn’t mean the story has to stop there. Now Mike Flanagan has so much to work with and he is free to do what he wants from this point on. It could be something amazing and I really would like to see a second season. I would watch this show again and again. It may become something that I need to watch every year in October because it was fantastic and scary and I want more of it. For me it is added to the list with Hocus Pocus and The Nightmare Before Christmas. It has to be watched a million times. Not to mention that I have a weird feeling that every time I watch it, I will notice something new that I didn’t see before. My suggestion to you, if you have not seen the show yet, go watch it. And pay close attention to it. Don’t look away for a second because you may miss something. There are a lot of little details thrown in that could easily be missed, which is something I absolutely love. Have you watched The Haunting of Hill House? If so, what did you think about it? If not, do you plan on watching it? I think you should! It has been a long time since I have been here. I will open WordPress and start to type something and then decided that I just wasn’t ready to come back. I tried to come back a few times and I wasn’t healed enough. It has now been a year and a month since my dad passed away. Things are getting back to normal for real this time. I am working a new job. We have caught up on our bills and we won’t lose the house. My dad is still a big hole missing in my life, but I am getting better. I am living again. I got up one morning and I realized that I needed to get back to my life. I needed to get back to the dreams I once had and the things I used to do. It was time to get back to reading and writing. I haven’t completely stopped doing all the things, but I slowed down to the point where I would have been better to just not do the things. But I want to get back to it. I thought there was no better time to come back then my favorite month of the year. Spooky month! I seriously enjoy the month of October. All my favorite things are around and it makes me happy. So, I start back my blogging journey this month! Here are some things I have planned. 1. Watch at least 1 horror movie a day. 2. Read all the Goosebumps and fear street books I have. I have 16 of them. 3. Write 1 spooky short story a week. I am going to get back on this road, this journey to being something more than just a girl who lives in the south and works in retail. My ultimate goal in life is to make my way to book con. Become a published author. And inspire others to follow their own dreams. I have had enough time to sit in the dark and feel sorry for me. My dad wouldn’t be happy with me if I didn’t keep going after my dreams. What are your plans for this month? ?